The process of choosing the right foods for a healthy and balanced diet can be a bit stressful. There are so many different products to choose from, which can make for quite a taxing grocery shopping experience. While all these products may seem the same, that may not truly be the case. Organic foods are becoming an increasingly popular alternative to commercially grown foods, and for good reason. The main reason why most people are making the switch to organically grown foods is simple; they want naturally grown foods that are better for them and the environment. However, it is far from the only one. Lets delve a bit deeper into the real reasons why you should switch to organic. Digesting potentially toxic chemicals seems like something you would want to avoid at all costs right? Well the easiest way to do so, is to eat organically grown foods rather than commercially grown foods. Non-organic crops are generally grown with chemical fertilizers and sprayed with pesticides in order to prevent pests. While these chemical fertilizers do promote plant growth, they can have potentially hazardous effects on our body when we consume them. The average person consumes around 16 pounds of chemical pesticides year, which is a little unsettling. Most of the chemicals used in commercially grown crops have never been tested for long term health effects, yet have been deemed “safe” for consumption. Organically grown crops however have to adhere to strict guidelines set by the United States Department of Agriculture (USDA). By eating organically grown crops, you can ensure that your food is free of potentially toxic chemicals. GMO stands for genetically modified organism, and it is a process that does not occur naturally in nature. GMO refers to products that have been altered with DNA from another organism. While the method of genetically modifying the food we eat has become quite popular, it can have some major repercussions. Genetically engineering organisms can cause nutritional deficiencies and produce new toxins and allergens. Consuming genetically modified foods can leave behind potentially hazardous substances inside our body’s, which can have many negative long-term effects. It makes sense that you would want to avoid GMO’s, but it can be quite difficult when buying commercially grown foods. However, organic crops cannot contain GMO’s. This means that you can completely avoid GMO’s altogether by choosing to buy organic foods over commercially grown foods. Not only do the chemicals used in non-organic foods harm our bodies, they can also harm the environment. The pesticides, chemicals, and fertilizers are damaging valued fertile farmland and polluting the ocean. The harmful chemicals used can leak into aquifers and run off into the ocean after rain. While pesticides are designed to keep pests at bay, a majority of the pesticides are simply left behind and end up damaging the environment. Considering the main purpose of pesticides is to kill, it makes sense why that very substance could be hazardous to the environment. Organically grown crops do not use any toxic chemicals in their fertilizer, which is much healthier for both the crop and the environment. While taste is completely subjective, many have claimed that organic foods generally taste better. Well nourished and well balanced soil produces strong and healthy plants. A stressed plant will have less energy to put forth towards growth, and usually doesn’t taste as good. The main focus of organically grown goods is taste, rather than looks. Commercially grown foods modify their crops in order to make them look more appealing, but this can sacrifice the taste of the crop. It makes sense that organic crops would taste better, for they are grown in a natural, stress free environment. The use of pesticides may keep bad pests away, but it also kills good ones. Pollinators such as bees or beetles are crucial in order to maintain the balance of the ecosystem. When we use pesticides and herbicides, we risk killing good bugs that help pollinate crops. The bee population is already declining at an alarming rate, and this could threaten global food security. 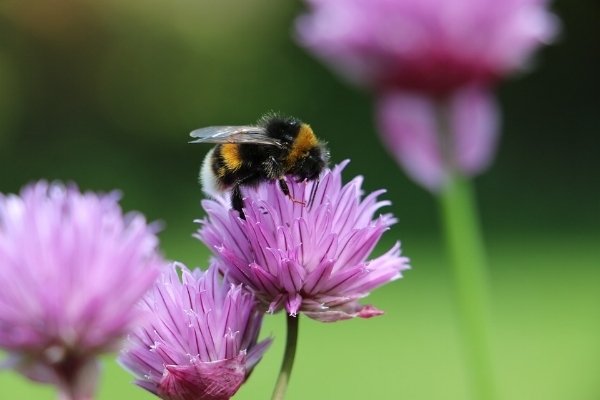 Rather than damage the pollinator population, organic farming helps support it. In the end, organic food is generally better for the environment and safer to consume. If you can afford to buy organic, it truly is worth it. By avoiding potentially toxic chemicals and substances, you can live a happier and healthier life. If you are interested in learning more about nutrition or simply want to live a healthier lifestyle, try contacting AboveFit Training. Schedule a free strategy call with one of our expert coaches, specializing in a personalized and holistic approach to health and fitness.